National Founders Chanukah Dinner for Chabad House The First Evening of Chanukah, Dec. 20, 2011, marked the 33rd Anniversary of Chabad House at Rutgers University. More than 500 community leaders and supporters gathered at the Hyatt Regency Hotel Grand Ballroom in New Brunswick, NJ, to celebrate with Chabad and honor Mr. Richard Saker, President and CEO of Saker ShopRites, Inc.
Dinner Chairs Jeff Greenberg, Lita Greenberg Jerry Zaro, Honoree Richard Saker, Laura Saker, Lt. Governor Kim Guadagno, Donald Hecht, Rabbi Yosef Carlebach, Roger Fine. The gala event was addressed by N.J. Lt. 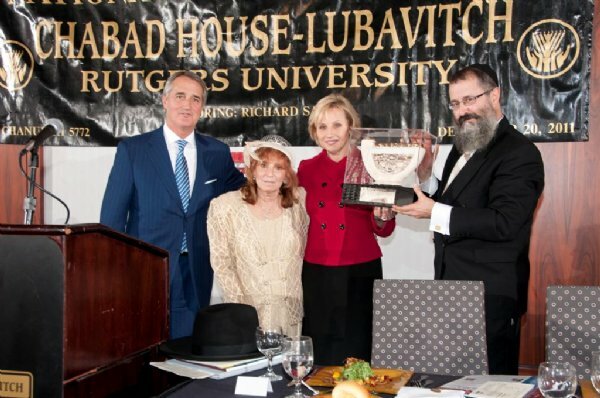 Governor Kim Guadagno, and the participants responded to the event by pledging an additional 1.5 million dollars to the Chabad House Building Fund. Chabad House is at the completion stage of constructing a 55,000 square foot facility, which will feature housing accommodations for 72 men, an international coffee house, a first-ever Sephardic Synagogue, expanded kitchen facilities, and a Kosher Dining Hall accommodating 770 students. This new complex, combined with existing 35,000 sq. ft. building, will serve as the largest Chabad House on any college campus in the world. The gala evening was chaired by Mr. Jerry Zaro, who introduced Rabbi Leib Groner, the secretary of the Lubavitcher Rebbe, to read the Message of the Rebbe. Mr. Sammy Saka. President of Hillel Yeshiva in Deal, N.J., lit the first Candle of the Giant Menorah, and a beautiful video was shown depicting the history of Kosher Food in America and Chabad's growth over the last three decades. Danille Wald, a Rutgers senior was warmly received by the crowd, as she described the daily ongoing activities at Chabad House, and her relationship with Chabad Campus Directors, Rabbi Baruch Goodman, and Rabbi Shaya Shagalow. Jerry Zaro, Lita Greenberg, Lt. Governor Kim Guadagno, Rabbi Yosef Carlebach. The President of Rutgers University, Dr. Richard McCormick spoke of the historic relationship between Rutgers and Chabad House. The President unveiled a beautiful portrait of the original Rutgers 'Old Queens' Campus that was given to Rabbi Yosef Carlebach, the founder and director of Chabad House. The Gala Dinner was also attended by officials from the Office of Governor Chris Christie, Senior Administration of Rutgers University, leaders of the Port Authority of New York and New Jersey, New Jersey State Police, New Jersey Transit, Sheriffs of Monmouth and Middlesex Counties, Mayors and Chiefs of Police of Municipalities in central and south New Jersey. The Honorary President of Chabad House, Mr. Donald Hecht, added his comments, and increased his pledge to be dedicated to the new Sephardic Synagogue by fifty thousand dollars. The keynote address was made by Lt. Governor Kim Guadagno, who surprised all dinner participants by reciting in Hebrew, the "Shehechyanu" prayer, and asked everyone to double their commitment to Chabad to enable the rabbis to meet the crucial needs of the community on campus, and throughout central and south New Jersey. Mr. Ronald Rak, President and CEO of S. Peter's Healthcare Systems, spoke of his hospitals' long-standing relationship with Chabad House, and surprised all at the dinner with his pledge to sponsor a "Bikur Cholim" Lounge at Chabad House for patient’s families in need. N.J. Senator Jennifer Beck presented a Senate Proclamation to the honoree, and spoke of Mr. Saker's philanthropy to more than 1500 charities in central New Jersey. N.J. Senator Jennifer Beck, Richard Saker, Rabbi Yosef Carlebach. Rabbi Yosef Carlebach, director of Chabad House, spoke of his history of 33 years with the Saker Family, and how he had met Mr. Joseph Saker, the father of the honoree, in a snow-storm in Freehold, NJ, in the late seventies. He fondly remembered the beginning days of Chabad in New Jersey, and the joint activities with ShopRite Supermarkets. The Rabbi credited Richard Saker and his family with creating the prototype for a greatly expanded kosher market. The evening's master of ceremonies, Jerold Zaro, stated, "Supermarket leaders had said no to kosher food. They said it took up too much space, was unprofitable, and worse. There are now kosher food sections everywhere in this country because of Rich Saker. Rich Saker is not Jewish; he is righteous." In accepting the "Ner Tamid - Eternal Light Award", Mr. Saker spoke of his history with Chabad House and Rabbi Carlebach. 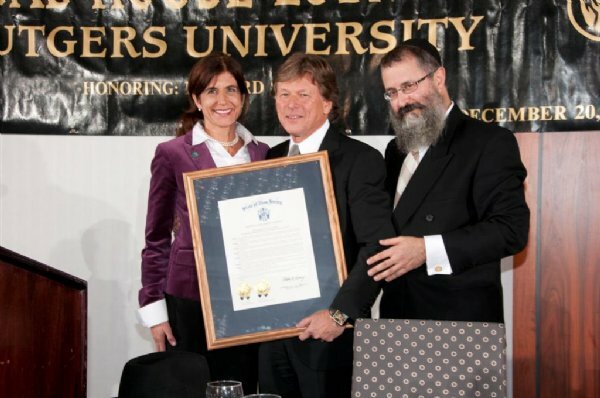 He announced that he would add $100,000.00 to his pledge to Rutgers Chabad as sponsorship of the new "Saker Family Kosher Kitchens" in the newly expanded Chabad House. As he received a beautiful sterling silver Menorah, he stated, "I personally find this evening to be very meaningful, and in reference to this Menorah, I think we can all agree the world needs more candles like we have here". Laura Saker, Lt. 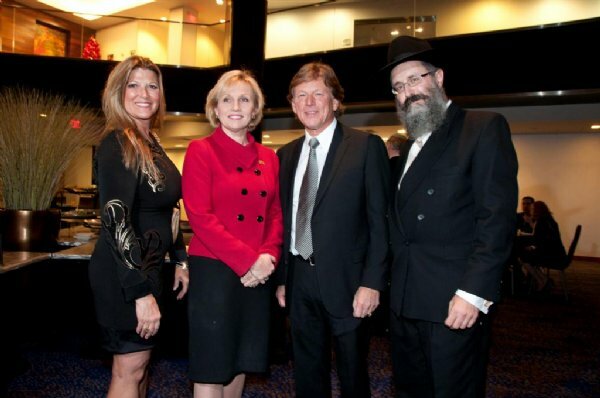 Governor Kim Guadagno, Rich Saker, Rabbi Yosef Carlebach. In delivering the keynote address, Lt. Gov. Guadagno said there was nothing more important than changing the lives of young people, "and that is what you do here (at Chabad) every day. 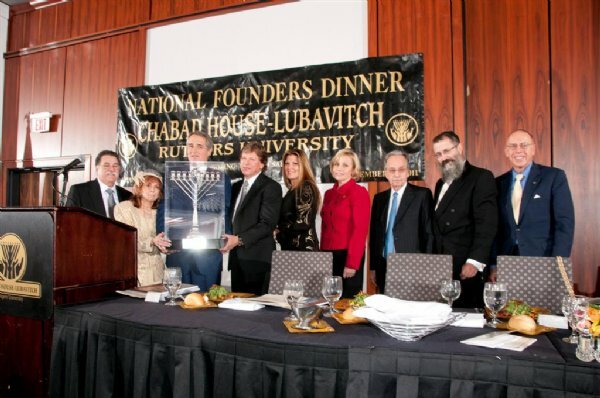 The evening was a celebration of 33 years of Chabad House at Rutgers University, and its ten affiliate Chabad House serving communities in central and south New Jersey. A total of 1.5 million dollars was raised during the Chanukah Gala Dinner.